After a week of lovely warm sunshine the late May bank holiday was, of course, cold, wet and windy. Nevertheless the hardy holiday makers at Southwold came along to the craft fair where I was displaying not only my semi-precious jewellery but also some glass and lampwork pieces. The atmosphere among we stall-holders was wonderful, with much banter between us whenever there was a lull in the crowds of visitors. One such lull was enlivened by a visit from some Molly dancers, all dressed up in their black and white en route to their dancing gig at the Lord Nelson. 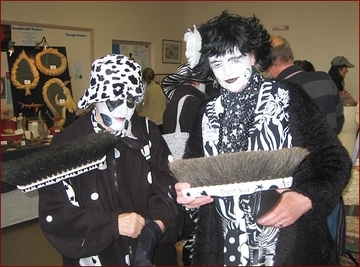 These were the Pig Dyke Molly dancers from the Fens whose black and white style is all their own. Molly dancers are more exuberant than Morris dancers and although the term molly once referred to men dressed as women, the Pig Dyke are a mixture - but the lack of identity remains; some returned the next day in their normal costumes and the only one to recognise them was Rob, the potter, who is himself a Morris dancer! 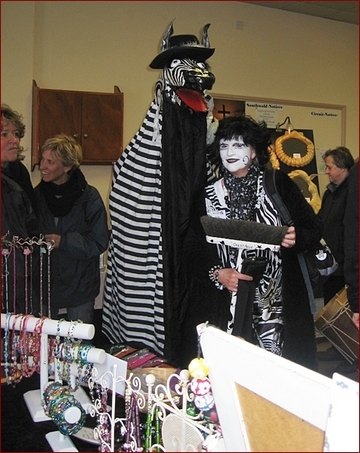 The lady with the broom, standing next to the zebra was delighted to find a black and white lampwork bracelet on my stall. "That's so Molly!" she exclaimed, and bought it immediately! If you live in Devon, don't miss them at the Sidmouth Folk Festival at the beginning of August.